From its beginnings in the 1920s until its demise in the 1980s, Bell Labs-officially, the research and development wing of AT&T-was the biggest, and arguably the best, laboratory for new ideas in the world. From the transistor to the laser, from digital communications to cellular telephony, it's hard to find an aspect of modern life that hasn't been touched by Bell Labs. 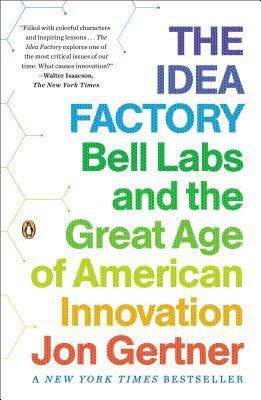 In The Idea Factory, Jon Gertner traces the origins of some of the twentieth century's most important inventions and delivers a riveting and heretofore untold chapter of American history. At its heart this is a story about the life and work of a small group of brilliant and eccentric men-Mervin Kelly, Bill Shockley, Claude Shannon, John Pierce, and Bill Baker-who spent their careers at Bell Labs. Today, when the drive to invent has become a mantra, Bell Labs offers us a way to enrich our understanding of the challenges and solutions to technological innovation. Here, after all, was where the foundational ideas on the management of innovation were born. Jon Gertner grew up in Berkeley Heights, New Jersey, just a few hundred yards away from Bell Labs. He has been a writer for the New York Times Magazine since 2004 and is an editor at Fast Company magazine. He lives in Maplewood, New Jersey, with his wife and two children.